Throughout the year, the Mission Trails Regional Park (MTRP) Foundation organizes art exhibitions for the MTRP Visitor & Interpretive Center. The work in the exhibitions either relates in some way to Mission Trails or presents themes from nature, in mediums that include photography, illustration, drawing, ceramics, and painting. Solo artists and groups are exhibited, the work is on view for six weeks, and artwork sales support park programming and improvements. This year’s first exhibition — titled “Natural Instincts” — features the work of seven award-winning artists: Joey Edwards, Otto Kruse, Caroline Morse, Thia Nevius, Bill Rainer, Chris Waters, and Susan Weinberg-Harter. “Natural Instincts” is on view through Feb. 15. Photographs by Mission Trails volunteer Gerry Tietje will be the second exhibition of the year, and feature Gerry’s stunning images of landscapes and birds, many of them taken at Mission Trails. Titled “Nature in Focus,” the photographs will be on view from Feb. 16 through March 29. A Wisconsin native, Tietje obtained degrees in electrical engineering from Valparaiso and Purdue universities, and moved to San Diego in 1973 to work for the Navy. Tietje has always had an interest in nature, especially in birds. He began experimenting with pen and ink drawings and watercolor in 1997, and with photography a few years later, taking photographs of birds to aid in identifying them and provide subject matter for his artwork. His photographic interest evolved to include wildflowers and landscapes. He honed his photography at Mission Trails, and enjoyed photographing nature so much that it became a primary pursuit. 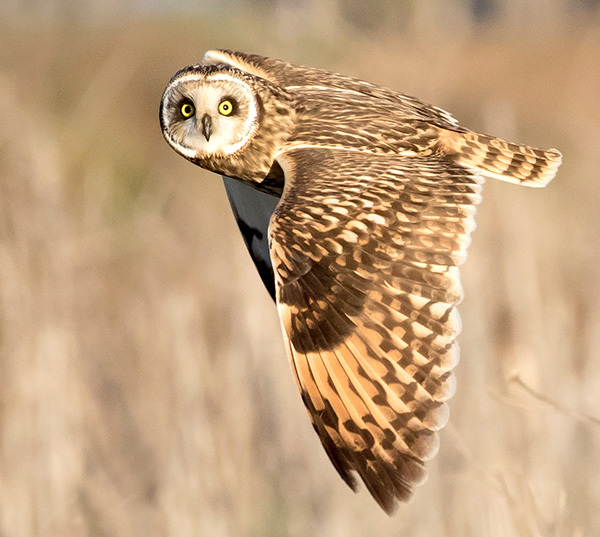 Since then, Tietje’s photographs have been published in Birds and Blooms magazine, several San Diego publications, and exhibited at the MTRP Visitor Center, San Carlos Library, and the local offices of the Audubon Society. In conjunction with his exhibition, Tietje will present the next installment in our photography lecture series, In Focus: Perspectives on Photography at Mission Trails. 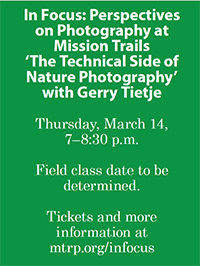 Taking place the evening of Thursday, March 14, the lecture is titled “The Technical Side of Nature Photography” and will be aimed at photographers who want to choose their own camera settings for pictures and include a discussion about the camera settings Tietje uses for landscapes, wildflowers and birds. Photo composition and how to capture appealing images will also be part of the discussion. For more information or to register for the lecture, visit mtrp.org/infocus. For a listing of this year’s art exhibits at MTRP, visit mtrp.org/art. —Jennifer Morrissey is the executive director of the Mission Trails Regional Park Foundation. *Partial listing of monthly events at Mission Trails Park. Visit mtrp.org for full calendar of free activities, programs, and updates, or call 619-668-3281.